Calvin called â€œprayer is the chief exercise of faith.â€ As one writer puts it, â€œwe do not pray for ourselves only but for God. We pray in order to become more involved with God and to fall, so to speak, more deeply â€˜in loveâ€™ with the Lord.â€[ ] There is no substitute for individual or communal prayer. As a spiritual discipline, prayer isnâ€™t pursued as a backdoor attempt at meriting favor from God. Instead, it is a means of daily grace from God. Prayer leads us to follow God in the midst of the unique, daily life that he has given to each of us. If kingdom-living is the with-God life, then prayer from a worshipping heart occupies a central and formative place. In prayer we converse with God himself by both speaking and listening. 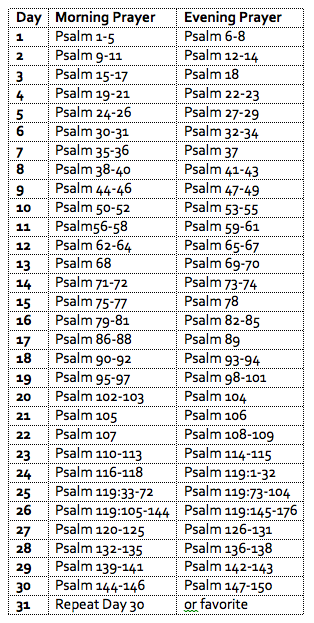 For centuries, Christians have made it habit of praying through the Psalms monthly as a regimen of daily prayer. The Psalms are both Godâ€™s word to us and our words to God, they are the prayers of the church, and prayed by and in Christ himself. Hereâ€™s my confession: prayer is too often absent from my language and life. I fumble and stumble through how to articulate my own life before God. I rush and tumble through life, in too much of a hurry and with too few pauses for prayer and reflection. Iâ€™d like to change that. Iâ€™d like to learn this year the rich and wide and deep, honest and true and raw, magnificent and magnifying vocab of prayer that God has given us. In the past, I have flirted with praying the Psalms over a month but never truly practiced it. Sure, over the course of the year I might read through the Psalms a few times â€“ but with nothing like a disciplined regularity. I hope that this year I may learn the praying of the Psalms as part of the rule of life I lead. Quote (and the Calvin quote) come from Robin Maas and Gabriel Oâ€™Donnell, Spiritual Traditions for the Contemporary Church. (Nashville: Abingdon Press, 1990). 135. If you'd like to receive my blog posts by email, sign up here. You'll need to confirm your address. It's a poor substitute for face to face, but if you have something to say - speak your mind!